New to the UK market and Exclusive to Mowdirect come Eco Friendly Greenworks. They cover everything from Lawnmowers, chainsaws, blowers, hedgetrimmers and edger’s. Pioneering, revolutionary, however you say it, the future of mowing is here. Delivering a clean cut, with a clear conscience and all the cable-free power you need, the Greenworks 40V Cordless Lawn Mower is an industry leading machine using sophisticated battery technology to produce petrol performance with emission free mowing. It is ideal for average lawns, up to 500M2 on one charge! Features are far from average, including the lightweight, but powerful lithium-ion battery, a mulch plug so you can compost your cuttings directly into the grass for a greener, healthier lawn, with a long running time and even longer usage time – plus an original folding handlebar system for neat storage. Charge it fast, use it, store it, pick it up and use it again. It wonâ€™t lose power in your shed. Battery and super efficient charger included. A chainsaw that offers you the freedom and power of petrol, with the clean energy and low noise of an electric, the Greenworks 40v 30cm Cordless Chainsaw uses market leading lithium-ion technology to deliver longer continuous running times, shorter charging times and power that wonâ€™t discharge, even in storage. An Oregon made chain and bar â€“ a mark of quality- is fitted and the features on this chainsaw are very top-end on a machine that offers such great value. Tool-less chain tensioning, auto-oiler with level window, cushioned grips, and anti-kick back chainâ€¦this tool has it all. Includes battery and charger. Landmark design and technology are at the forefront in this groundbreaking ultra lightweight, cordless Trimmer/Edger from Greenworks, the â€˜no carbon emissions everâ€™ brand. This single nylon line trimmer is powered by advanced lithium-ion batteries that have short charge times, donâ€™t leak power and run the trimmer continuously for 70 minutes. Thatâ€™s 40% longer than conventional models. There is a rotating head for easy edging, which also pivots for cutting at awkward angles. The cutting diameter is 30cm and there is a variable speed â€“ a great feature on this real value for money garden tool. Battery and charger are included! Extra light, super powerful and designed for ease and comfort, the Greenworks 40v Cordless Hedge Trimmer uses the power of lithium-ion batteries to trim for longer, delivering up to 30% more power than conventional batteries, with minimal charging times and no power leakageâ€¦ even after months. 60 cm reciprocating blades deliver a long reach and a smooth cut while the operator works in total comfort thanks to cushioned, vibration-reducing handles and â€“ a great feature in this price range â€“ a rotating handle helps cut your hedge at multiple angles. Battery and hi-techâ€™ charger included. Get rid of leaves and twigs at high speed without inhaling petrol fumes or becoming tangled in cables. The Greenworks 40v Cordless Variable Speed Leaf Blower works fast thanks to its hi-tech, lithium-ion battery, delivering a continuous run time of 70 minutes â€“ 40% more than conventional batteries. It also offers a shorter charging time and no power loss, even when stored for weeks. A variable speed motor delivers jets of air up to 150 mph, clearing to detritus effectively and the low weight and ergonomic design make the blower very easy to manipulate. No cables, no fumes, no fuss. This multi-faceted battery powered trimmer/edger will take on a wide range of trimming duties thanks to a pivoting head, enabling cutting on slopes and banks, also rotating through (90Â°) for edging. The revolutionary lithium-ion battery provides amazing power and flexibility with shorter charging times – half the length of some comparable models, and longer running time â€“ up to 3 times longer than equivalent NiCads. What is more, there is a comfort handle, cushioned forearm rest, variable speed control and extremely low weight ratio. Battery and wall mountable charger are included. Longer running, shorter charging and producing more power, this Lithium-Ion battery is what you need to charge all your Greenworks 40v cordless tools. It wonâ€™t leak power when not in use, you can charge it anytime even in the middle of a charge and it has a battery level indicator to let you know where you are in a cycle. Advanced, clean running and easy to fit and use, this battery technology is the future of garden tool power. NB: This battery will not operate with 20v or 24v Greenworks cordless tools, or with cordless tools from any other brand. Cut your hedges more quietly, quickly and cost-effectively with this ultra-lightweight and advanced trimmer from Greenworks, whose longer running, shorter charging lithium-ion battery technology delivers up to 30% more power than conventional batteries. Complete with 56cm reciprocating blades, cushioned grips and rotating handle for varied angle cutting, a surprising feature in this cost range. This lean, green trimming machine comes with battery & charger for clean power that wonâ€™t discharge between jobs! Clear leaves, twigs and grass clippings cleanly and effectively with this technologically advanced cordless blower from Greenworks. This blower has built in operator comfort and no carbon emissions, powered by lithium-ion batteries with more power, run time and no power loss for fume free and cable free operation. It has a 2-speed motor – 90 and 130mph, with cushioned comfort-grips to reduce vibration and the balance, design and very low weight, 1.5kg, makes it very easy to handle and use. Battery and charger are included. With all the power you need for making logs and cutting back branches, the Greenworks 240V 46cm Electric Chainsaw is emission free and quiet, as well as lightweight, well balanced, and safe and easy to use with a mechanical chain brake, safety switch, oil level indicator window and an anti-kick back chain and 46cm chain bar from the top manufacturers Oregon, for a wider, more reliable cut. Special cushioned grips are included for comfort and chain tensioning is tool-less and easy to carry out. A fast charging, hi-tech battery with 3 times the continuous runtime of a NiCad battery, this unit will not lose itâ€™s power in storage and can be charged at any point in its cycle with no negative effect, so you can top up when you need to without worrying. Low weight and easy to fit, the Greenworks 24 Volt / 2 AH Lithium-Ion Rechargeable Battery delivers full power all the way through the cycle with no â€˜winding downâ€™ effect. Powerful and emission free from zero carbon emission experts Greenworks, with built in reliability from the famous â€˜Oregonâ€™ manufactured guide bar and chain, plus great features like an oil level indicator, tool-less chain tensioning with good balance and weight to power ratio, the 40cm chain of this high-quality 240v chainsaw will cut plenty of logs or prune and limb with ease using clean, mains electric power and can be used safely with the anti-kick back chain, the safety switch to stop accidental starts and an included lockable protective cover. This wall-mountable, lightweight and compact charger provides the juice for any Greenworks 40v lithium-ion battery, enabling you to quickly charge and run a collection of powerful, cordless garden tools. Delivering diagnostic information and letting you know when a charge is finished, the charger provides Greenworks batteries with clean power with no fuss and no bother. NB: This charger is only for use with Greenworks 40v batteries and will not operate with 20v or 24v Greenworks batteries or with batteries/products from other brands. Lightweight, fast charger for Greenworks 24v lithium-Ion batteries this charger is compact, wall mountable and very efficient, it delivers charging information and can charge any Greenworks 24v battery in a very fast time. NB: This charger will only work with Greenworks 24v batteries and wonâ€™t work with 20v or 40v Greenworks batteries with batteries/products from other brands. Be one of the first to buy our new & exclusive autumn planting Onion ‘Tornado’. Plus, get 20% off your autumn planting onions and shallots until midnight Monday! 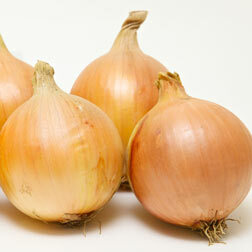 Onion ‘Tornado’ – An overwintering onion with a milder flavour than other autumn varieties. Delicious in salads, but equally at home in stews, where it holds together well. ‘Tornado’ stores for up to 8 weeks and is the perfect variety for bridging the gap before your next spring onions are ready to harvest. Hurry, offers end midnight Monday 3rd September. Autumn Planting.New and Exclusive Onion Tornado comes from the same breeding programme at HRI Wellesbourne as the hugely popular, Shakespeare. We foresee Tornado quickly becoming a competitor as the best overwintering onion variety. Maturity is from late June when Tornado can be harvested and stored for up to 8 weeks until the spring-planted varieties start cropping, so maintaining your onion supplies. With good resistance to bolting, Tornado produces a slightly deeper round bulb than Shakespeare and much rounder than the Japanese ‘Senshyu’ types. More tolerant of drought and shown to successfully produce crops in heavier soils, you should plant Tornado in October for optimum results, although a September to November planting will also produce good yields. Beautiful though they are even green, they’re not ripening! I really should look up and check what varieties I planted! Sungold for me next year I think. 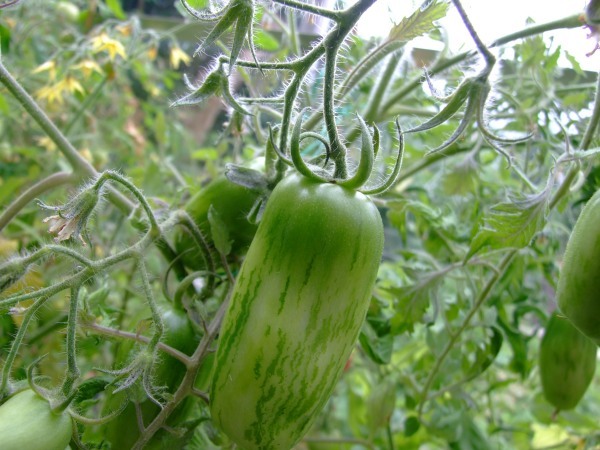 Someone on our site has plenty of outdoor tomatoes that are already ripened! Claytonia is part of my winter plan this year. It said to plant in August so I’ve put some in pots a few days ago. It’s starting to come up already! I am pleased! The corn salad Vit I planted at the same time isn’t showing yet! Claytonia is also known as Winter Purslane or Miner’s lettuce. 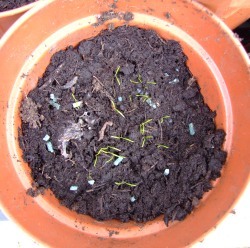 It’s in a cold frame – with slug pellets too. The weather has been awful this year! I saw on the weather forecast last night that this summer has been the dullest for many years! It’s always interesting to hear the weather report look back over the summer and see what records have been broken this year. This years June was the wettest for 100 years – and the other summer months were also real soakers. After the early drought warnings and hosepipe bans though it was probably needed though – that doesn’t help if you wanted to enjoy the sunshine. This year has been a real trial on the allotment. The weather has kept many people away, but has encouraged both slugs and weeds to grow massively. Currently there are several very soggy areas on the site highlighting just how much rain we’ve had recently. It’s been good for the frogs though as several have been seen from this years baby ones to large older frogs! It’s the last day of summer as I write this and my raspberries look like they’ve been affected by the cold and the greenhouse was 9’C last night. This is shockingly for August but fits in with the rest of the years weather. Within an hour though the temperature soared as the clear sky allowed the sun to shine brightly! But by the time I’d got round to take these photos it looks like rain once again! Save 20% on plugs and garden ready plants when ordering from this fantastic Bedding Bonus Bonanza range! Original and best ruffled pansyPansies are part of the Viola family. This beautiful ruffled pansy comes in a mix of pastel colours with dark centres. These pansies will flower from Autumn through to Spring providing a fantastically long flowering period. Pansy Can Can is the original and best ruffled pansy. Sweet Pansy that’s perfect for pots and bordersNew to our Autumn range, this brilliant Pansy has large flowers with bright and zingy colours. Grown to look fantastic in pots and borders with fantastic winter performance. This free flowering dwarf variety of daffodil is great for garden containers or pots and can also be grown indoors. A delicate bulb to have in your garden with it’s tiny white head peeping out, often through the worst of the weather. People love snowdrops as they show that winter is nearly over! I’d like everyone to plant some crocus bulbs this autumn for extra spring flowers! Spring bulbs are a real treat for the eye after the cold weather to see bulbs peeping out of the ground and flowering so early in the year.